Yesterday morning was fresh and promising. 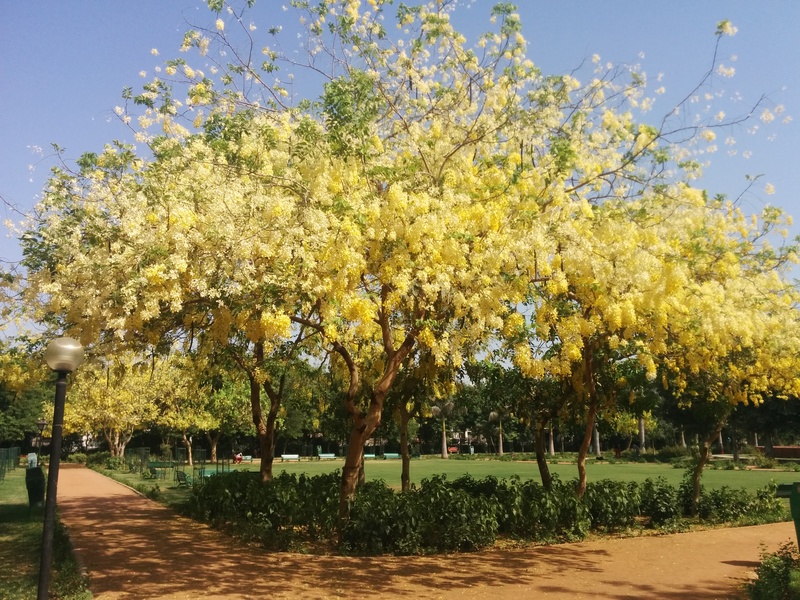 It had rained earlier, so when I went to the park for my morning walk, the trees were clean from their fresh shower, shining their true colors more clearly: the dark greens looked deeper, the light greens looked cleaner, and the yellows popped, an absolute delight. The people on their morning walks seemed happier; the showers had broken the harsh heat of Delhi summers. I walked and as I did, I felt myself relaxing. Stray thoughts and worries began to leave me, seeping into the wet earth. There is magic in walking. Being close to nature fills up my creative well with images; the silence is a relief from the constant input from people and my cellphone and yes, even books; the walking motion is rhythmic and comforting. I feel alive, creative, abuzz with ideas, yet relaxed. I sit on a bench, the one made of clay and stone, red and white, cool to the touch. I prefer it to the green iron benches; the clay makes me feel one with the earth. I scribble in my little notebook, the one with faux yellow pages and artistic coffee stains, ideas about topics I can write about or sudden insights from thought particles that fuse together as I walk. Sometimes I scribble questions to which I don’t know the answers. I am lost in my thoughts scribbling in my little notebook on this beautiful morning, and I look up, still half smiling only to catch the eye of an old gentleman, who smiles kindly at me. If you don’t mind, he asks, out of curiosity, what do you write? He has seen me on other days on this bench with my little notebook and my pencil. I am a writer, I say, and then, because that’s what recovering creatives do, I soften my stance, I write, I say, so just jotting down ideas for my writing. He understands. Nothing like writing in this beautiful park; I used to do that a long time ago. You are a writer, so start acting like one, is what Jeff Goins says. I have started acting like one. I carry a little notebook for when inspiration strikes, underline passages in books and copy them down for the future. And yet sometimes, I am scared. “I’m a writer” sounds scary, irreversible, terrifying. And yet if I look around my bookshelf, I see the signs. If You Want to Write, Wild Minds, The Artists’ Way, What It Is, On Writing Well. Writing calls to me and I have been preparing for many years, reading, absorbing. Whenever my sister and I meet, we have gifts for each other, a blue star studded journal, or a quill pen, or a notebook with silhouettes of women, their loose clothes flying in the breeze. With our gifts, we mean to prod each other, write. As a little girl, letters and words were a thing of beauty. Letters, their shape, their cursive form, the way they connected, flowing into each other. Each script had its own magic, its own mystery. My father could read Urdu, a language his father wrote in, and though I couldn’t make out what the letters meant, the script was beautiful. It ran delicately from right to left, breaking the rules, beautifully. Hindi read beautifully too, all the letters hung to a line on top, free below. English, I practiced in my cursive writing book, and the other practice book, more staid and solid. My best friend had given me a single sheet of paper with all the letters in the English alphabet printed out in calligraphy. I practiced drawing the letters at home with a Parker flat-nibbed pen and black ink, writing beautiful quotes on plain paper in calligraphy, and found myself a little bit repaired with every harmonious line that I drew on paper. Today, I type away on the computer instead of drawing with my flat-nibbed pen, but I continue to be repaired, as I was back then, my voice growing stronger, my light glowing brighter, and my feet becoming surer-footed. As I write, I am becoming. Awwwww! Thanks so much! So glad you liked it.